I’ve been spending every day in Hairmyres Hospital with my mother, the very same East Kilbride hospital where George Orwell once stayed. Since Friday I’ve been here. She’ll be in the rest of the week. She’s here with severe and acute pneumonia, complicated by her old familiar heart issues. 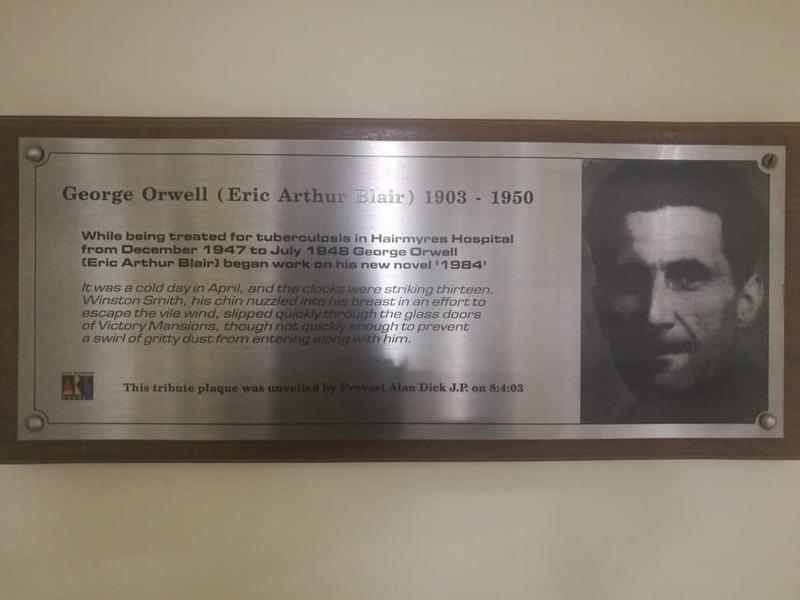 Orwell was here too, recovering from TB, there’s a plaque to prove it. But it can’t have been the same place, because how could 1984 happen here? I never thought I’d write a post on the conviviality of hospitals. I have hated them, after all my anguished time there with my dad and then my mum. Hated them despite immense admiration for the competence and compassion of the nurses and other staff and even some of the doctors. But I’ve had to change my mind just a little in a way that has highlighted the everyday brilliance of people in helping each other get along. It’s so easy to forget in our world. After many room moves due to an NHS in crisis combined with snowy, icy weather, she has ended up here in this particular ward. She is sharing a room with three other women. It is big and square, airy with big windows in this older building that is the closest thing here to something almost pleasantly residential. When we got here, the others were: B in the bed next to her, J across and E along the diagonal. They have been so lovely these women. E the oldest, so desperate to go home. Tiny, frail, beautiful. I thought at first the loveliest thing I had seen in ages was her face when the nurse opened the curtains and E whispered sunshine. But no. I saw her face when her husband walked in. The transformation had everyone tearing up, and me? Cried…couldn’t stop, it was embarrassing. I missed M, and besides honestly, it was the most beautiful thing I have ever seen. 64 years married. Isn’t he handsome she said, and smiled again. It lit up the room. B has been there the longest now, she and J set the tone when we got there. Friendly, everyone checks in on each other, makes sure they have what they need. Tells stories, tells jokes, calls across the room to say hello. The nurses and aides join in. J walking over to tell me how lovely my mum was, how happy she was to meet us. Everyone cried when she left. In her place T, who doesn’t speak too much English and is quite deaf (as is my mother and as was E, so we are in ‘the shouty ward’) and very hard to understand. The friendliness continues, though it’s harder when you have no idea what she needs — both she and my mum do a lot of nodding and smiling. Family come and go, we know each other, joke back and forth. The woman who was in the bed before mum, now well and back at work, dropped by to bring cakes and prawn sandwiches. E left today, that amazing smile never left her face this morning. More tears for the rest of us, most of the staff came to see her go. From her I learned the phrase ‘need a penny’ for having to go to the bathroom, ‘spending a penny’ for going, we heard it lots. It’s such an intimate space, everyone knows everything. It could be my worst nightmare, should be. If you have to be in hospital, though, with everything most private suddenly public and bored and in pain as you always are…well, this is the way it should be. A nurse walked in after E left holding up a blanket, saying that’s the size tissue they would need for the day B leaves. They are quite wonderful. I will miss them. A is there now (there aren’t enough beds in the hospital for everyone who needs one). We don’t know her story yet. 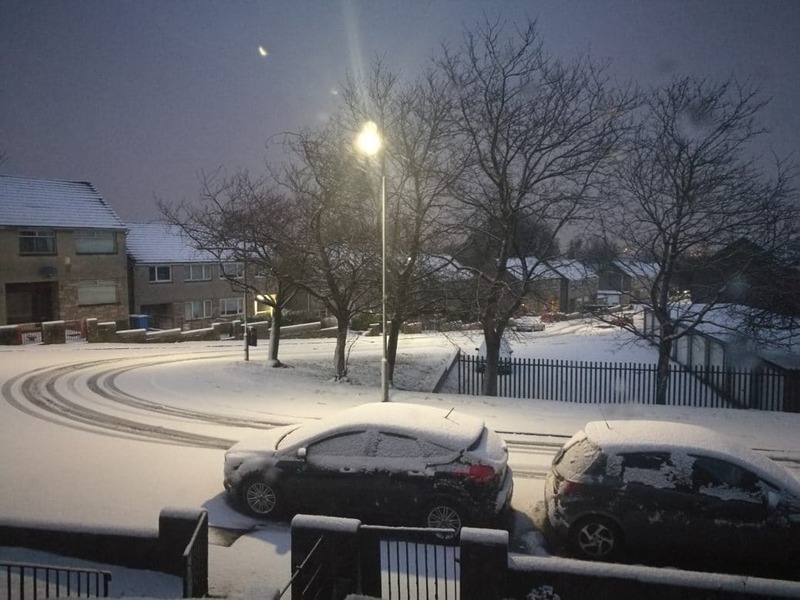 I might be back tomorrow, might not make it because the snow has been coming down. The drive back this evening was terrifying though my brother is experienced at driving in snow. Sadly none of the other drivers are. But it was good to get home to my tiny brand new nephew and L and the smell of stew. Tomorrow, a full-on wonderland I think. Orwell was admitted to Hairmyres under his real name, Eric Blair, on Christmas Eve 1946. He suffered from tuberculosis in one lung. At the time of his admission he was busy writing his novel “1984”. The staff, insisting that complete physical and mental rest was essential for effective treatment, confiscated his typewriter. With rest his health improved to some extent but attempts to rest his badly affected lung by simple surgical procedures were not very successful. He suffered severe side effects from his treatment, and although the disease was responding, it had to be stopped after fifty days. The remaining supplies of streptomycin were administered, with success, to two other patients. Orwell’s typewriter was returned to him in May 1948 and he spent the remainder of his stay in Hairmyres writing, walking in the grounds and playing croquet. I am unsure, therefore, how accurate the plaque is. Sadly, you can no longer play croquet here, but I wouldn’t be surprised if the building we’re in now wasn’t part of the complex. Most of it has disappeared, what you see now is a very expensive building built through a Private Finance Initiative. I hate those. What I do love though, is that the first incarnation of this place was as a reformatory for inebriates. 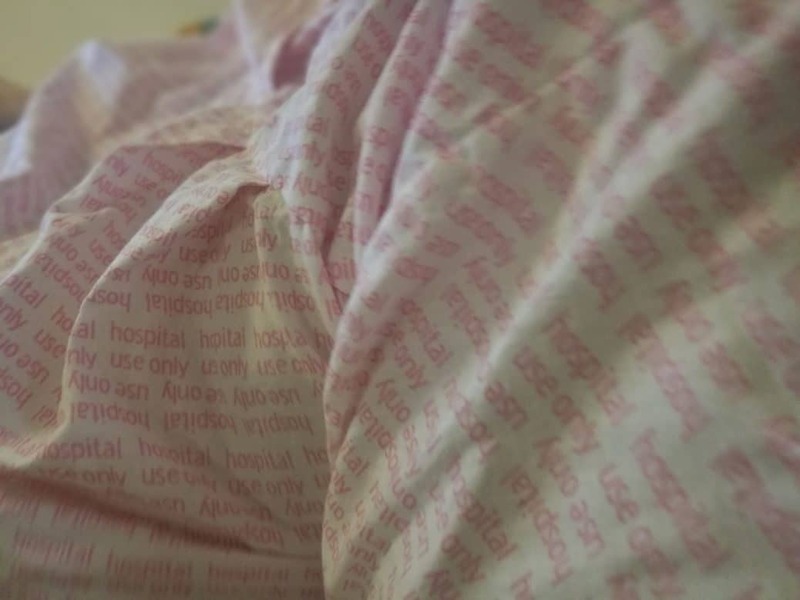 They still try and make sure you don’t steal the most excellent hospital gowns. Très beau texte, très sensible! J’aime beaucoup cette description, et le personnage décrit: “Tiny, frail, beautiful. I thought at first the loveliest thing I had seen in ages was her face when the nurse opened the curtains and E whispered sunshine. But no. I saw her face when her husband walked in.” J’espère que votre mère va mieux. Amitiés.